jewelry by Beth Lee Stern. All items in this exhibit are for sale. 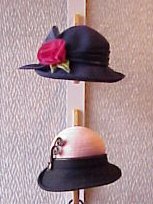 With a 20 year background in clothing design Val's designs have evolved into hat design. She starts her designs at the crown of the hat by machine or hand sewing, painting, shaping, and stabilizing braid(or woven cording, hollow tubing, and ribbon) at the crown and makes the hat a sculpture as she sews. Add embellishments of beads, buttons, feathers, and/or fabric, often inspirations from nature, and like snowflakes, each piece is unique. Val is aware of form and function and views her pieces as sculptures contoured to fit the body. As wearable they must be balanced for comfort and sturdy to withstand use. A Fashion Design graduate of Mount Mary College in Milwaukee, Wisconsin, Val's clients include The Great Circus Parade, Milwaukee Art Museum, Milwaukee Public Museum, and Boerner Botanical Gardens. Her art show awards are many. We think it is fun that she had a show recently at the Kentucky Derby. Interesting fabrics and textiles inspire Debra to make her reversible coats, jackets, and vests. Most are designed for women and by special order for men. Her source of materials is the textile district of lower Broadway in Manhattan, the African markets in Brooklyn, occasional vintage and suburban discount stores, and fabric brought back by friends who travel internationally. 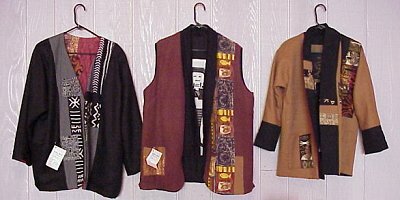 She uses techniques of appliqué, piecework, embroidery, painting, and beading to create garments that are truly "one of a kind". Debra's interest in sewing started at age four when she had an interest in making doll clothes, but not necessarily in playing with dolls. Her mother and grandmother started her sewing instruction; she added practical information along the way. 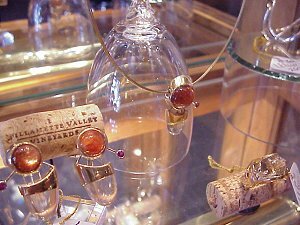 Since 1982 her designs have been available at selected craft shows and galleries on the east coast and in the Midwest. All designs can be made to order, designed so the wearer can truly enjoy both sides of each garment. Debra will be available sometime in August to measure and discuss your preferences. Although Beth was a sculpture major at the University of Northern Iowa, she found her medium in goldsmithing. She had watched her brother, David Lee, who from age 14 had books and tools on goldsmithing. Her work has evolved into "one of a kind" pieces that can be enjoyed from any angle. Her bracelet's clasps enchant and surprise. Pendants can also be pins, barrettes or maybe even a tie bar. When gem stones are used their shapes and colors speak to the metal, telling it whether the piece is going to be soft and creamy or crisp and clean. Beth states "creating things of beauty is a celebration of life and I hope to share my gift with the people around me". Beth and her brother just presented their creations in the Art Fair on the Square in Madison, WI. She will be showing her work in five more juried art shows this year. Beth lives here in Monticello now and has supported many of the local fund drives with donations of her work.